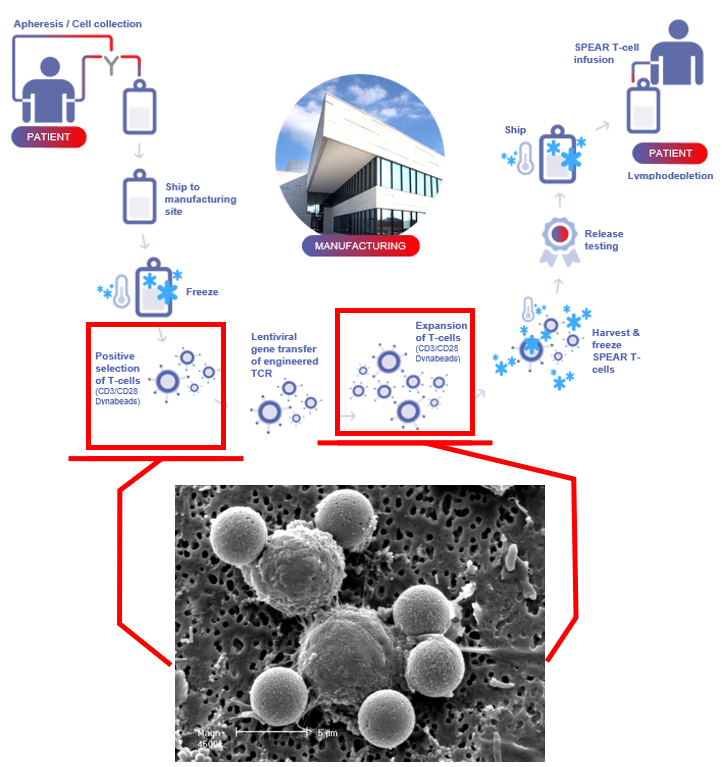 Adaptimmune’s affinity enhanced SPEAR T-cell therapeutic candidates are novel cancer immunotherapies that have been engineered to target and destroy cancer cells by strengthening a patient’s natural T-cell response. T-cells are a type of white blood cell that play a central role in a person’s immune response. Adaptimmune’s goal is to harness the power of the T-cell and, through its multiple therapeutic candidates, significantly impact cancer treatment and clinical outcomes of patients with solid and hematologic cancers. The CTS Dynabeads CD3/CD28 play a key role in the activation of Adaptimmune SPEAR T-cells during manufacture. CTS Dynabeads CD3/CD28 are magnetic beads used by Adaptimmune for ex vivo isolation, activation, and expansion of human T-cells. By combining anti-CD3 and anti-CD28 antibodies on the Dynabeads, the beads provide both the primary and secondary co-stimulatory signals that are required for activation and expansion of T-cells. introducing the affinity enhanced cells back into the patient to enable the patient's immune system to respond and attack cancer. Important steps of this manufacturing process include isolation of the T-cells from patient material and subsequent activation and expansion of the T-cells prior to re-infusion. CTS Dynabeads CD3/CD28 are integral to this process and key to the production of active, persistent T-cells. In 2012 and 2013, Adaptimmune secured exclusive licenses and supply agreements from Life Technologies Corporation (acquired in 2014 by Thermo Fisher Scientific Inc., NYSE: TMO) under certain intellectual property rights covering methods of expanding and activating T cells transduced with engineered T-cell receptors (TCR) in the fields of treating cancer, infectious diseases and autoimmune disease. In 2016, Adaptimmune signed a further agreement with Life Technologies Corporation. This new commercial development and supply 10-year agreement augments Adaptimmune’s exclusive license and supply relationship with Thermo Fisher for the Dynabeads CTS for use in the manufacture of Adaptimmune’s SPEAR T-cell therapies.